From religion to animal's feelings, Martel's novel covers a wide range of controversial topics. Join Pi Patel on a life-threatening shipwreck that makes him question life itself. The son of a zookeeper, Pi Patel has an encyclopedic knowledge of animal behavior and a fervent love of stories. When Pi is sixteen, his family emigrates from India to North America aboard a Japanese cargo ship, along with their zoo animals bound for new homes. The ship sinks. Pi finds himself alone in a lifeboat, his only companions a hyena, an orangutan, a wounded zebra, and Richard Parker, a 450-pound Bengal tiger. Soon the tiger has dispatched all but Pi, whose fear, knowledge, and cunning allow him to coexist with Richard Parker for 227 days while lost at sea. When they finally reach the coast of Mexico, Richard Parker flees to the jungle, never to be seen again. The Japanese authorities who interrogate Pi refuse to believe his story and press him to tell them "the truth." After hours of coercion, Pi tells a second story, a story much less fantastical, much more conventional--but is it more true? Yann Martel was born in Spain in 1963 of Canadian parents. 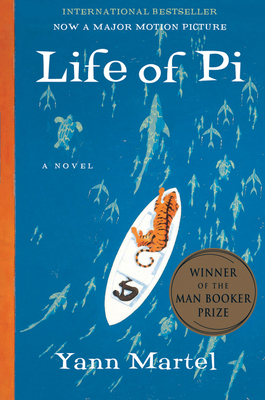 Life of Pi won the 2002 Man Booker Prize and has been translated into more than forty languages. A #1 New York Times bestseller, it spent 104 weeks on the list and was adapted to the screen by Ang Lee. He is also the author of the novels Beatrice and Virgil and Self, the collection of stories The Facts Behind the Helsinki Roccamatios, and a collection of letters to the prime minister of Canada, 101 Letters to a Prime Minister. He lives in Saskatchewan, Canada. Gramercy Books is a locally-owned, independently minded, carefully curated neighborhood bookstore located in the heart of Bexley, Ohio. Gramercy Books is located conveniently in the heart of Bexley, Ohio. You’ll find us at the intersection of East Main Street and Cassady Avenue. Parking is readily available in front of the bookstore on East Main Street everyday (excluding weekdays 4pm to 6pm), along Cassady Avenue, or in an adjacent parking lot behind the bookstore accessed via Cassady Avenue. Receive updates about news and events.